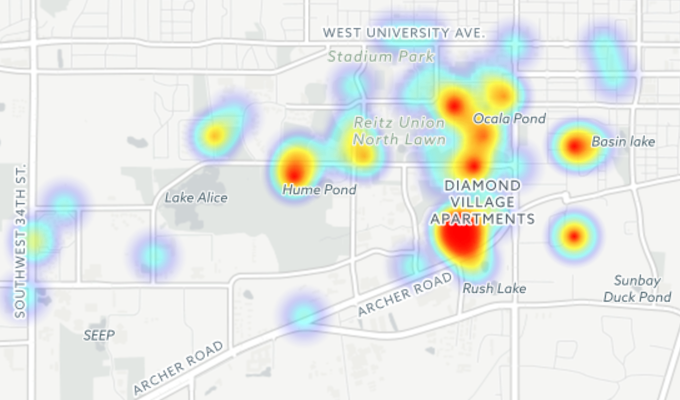 Sexual assaults and other sexual crimes have been mapped at the University of Florida for the first time. The Tab UF undertook this project to give the Florida student body a clearer picture of where most sexual crimes take place. The following data is based on three years’ worth of police logs, which the university is obliged to disclose. The majority of sexual assault cases were reported from dorms at 58 percent, as opposed to fraternities who clock in at lower numbers with 33 percent. 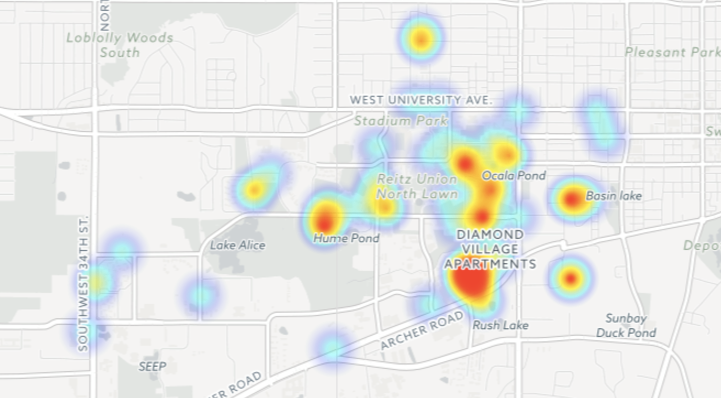 Though attacks within these dorms were commonly reported in locations near fraternity row such as Springs and Keys. Beaty Towers, a dorm for students of all years at UF, has had six rapes reported there over the past six years. Jennings and Broward, both dorms for freshmen, have reported three rapes each. 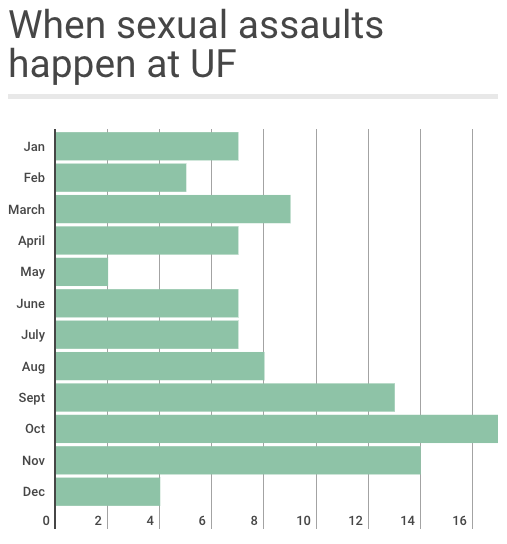 Throughout the several years documented, 44 percent of sexual assault cases were reported at UF in the months of September, October, and November, which correlates with research into the “Red Zone” – when students are most at risk of sexual assault. 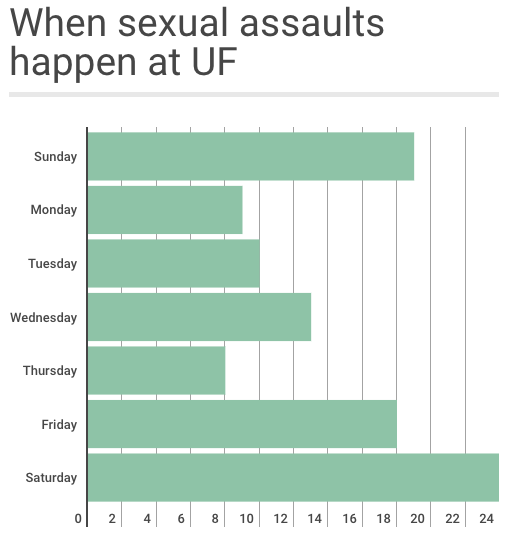 In preparing this article, we spoke to Rita Lawrence, the Interpersonal Violence Prevention Co-ordinator at UF, to help us look further into the data behind sexual reports on campus. She said: “There’s actually been mixed research on, ‘Is there a Red Zone?’ or a time frame that sexual assault is more likely to happen to college students. And to us, it’s based on a lot of students coming to campus that are new, [that] don’t maybe know the culture here and aren’t familiar with alcohol consumption. Interestingly, a large number of reported assaults by far came from Shands Hospital. 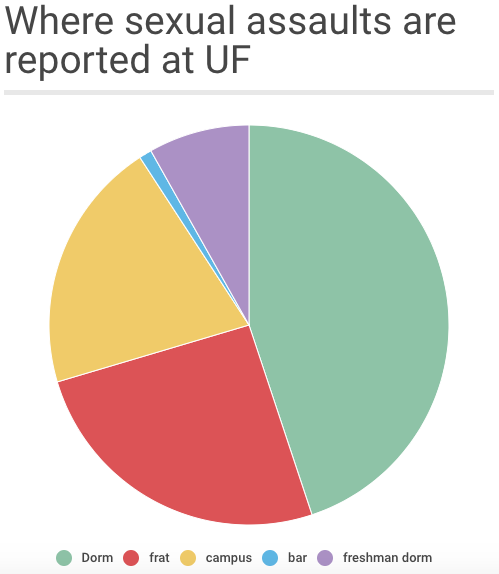 When compiling this data, we noticed that 16 percent of reports had a listed location at UF’s hospital. We have contacted UF multiple times about this for clarification – to ask if such a high number of sexual assaults are taking place in the hospital or are merely being reported from there – and they have yet to respond. A similar statistic appears at the University of Virginia. A spokesperson there explained: “Many of these calls are reported by consumers of mental health care. UPD always responds, interviews complainants, files reports and investigate the offenses reported. Many reports could be generated by remembering past events while undergoing treatment in our facility. Sexual crime was most common on weekends – over 60 percent of incidents were reported on Friday, Saturday and Sunday. However, there was an unusual spike in reports on Wednesdays. This is likely due to the influx of people to Midtown for ladies’ night. She added studies done at the University of Florida match the nationwide statistic that 1 in 5 women experience sexual assault. Regardless of gender, Lawrence wanted students to know they are protected by the amnesty policy if they need to come forward with sexual assault. The amnesty policy allows students to seek out help for issues regarding health with protection from law enforcement if breaking laws, such as underage drinking. “Any investigator is helped most by the actual truth,” she said. The University of Florida’s sexual assault records were easier to obtain than other schools. Our rival school, Florida State, initially refused to release sexual assault records to The Tab FSU. They eventually had to pay the FSU police department for records that should have been public in the first place. It’s commendable that our university provides access to this information so we can better understand our safety as a student body. If you or someone you know has been a victim of sexual assault you can contact the UF Police Department at (352) 392-1111 or the UF Counseling and Wellness Center at (352) 392-1575.